Fell in love with this dress from the moment it was on. 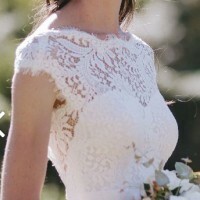 Out of maybe 50 dresses tried on, this one stood out in design, fit and comfort. 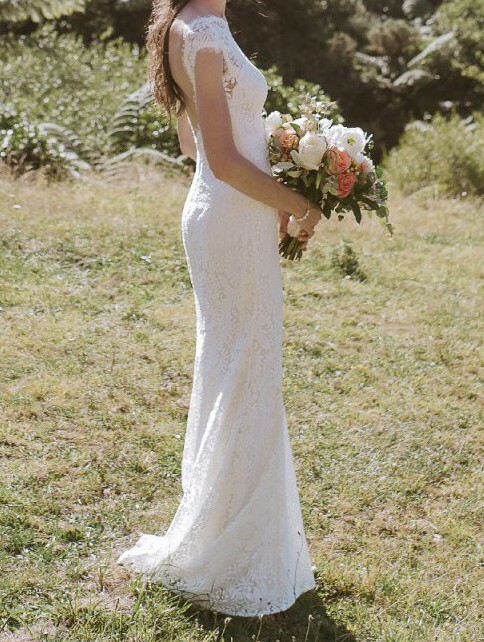 So easy to walk in (or float around the dance floor), with super soft lace that you can't help running your hands over, and an airy back which was a lifesaver on a summer's day wedding. It was so beautiful on its own, no veil needed. Very sad to part with this dress but can't bear to put it away in a cupboard, it needs to make someone else's dream day. Hemmed to height (1.74m with 5cm heel), minor lace fraying along hem which will be hidden with a further 0.5cm hem. In built bra cups.